Final Audio Sonorous III review | What Hi-Fi? Sonorous (adjective): capable of producing a deep, full, ringing sound. So ‘sonorous’ is a strong, positive word with only good connotations when it comes to hi-fi equipment. So why are we so ambivalent about it? Is it because it reminds us of soporific, or sounds a bit like ‘snoring’? We didn’t let that bother us when we reviewed the bling-tastic Sonorous X headphones towards the end of last year. 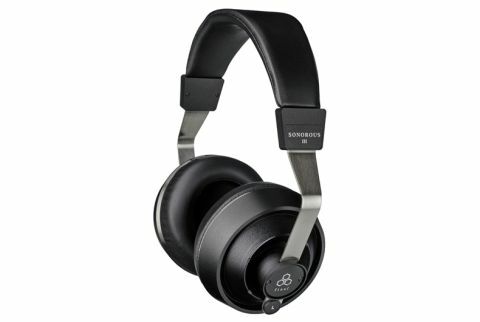 Mind you, they cost over ten times the price of this pair, the Final Sonorous III, so we’re not expecting to draw too many comparisons beyond vaguely dwelling on the name. There are visual similarities, though. The Final Sonorous III headphones are built to the same broad template as the Sonorous X, although mercifully short of the latter’s shiny finish. They’re big – though not AKG K550 ear-defenders big – and sturdily constructed from a combination of carefully specified materials. Despite the bulk, though, and a relatively steep kerb-weight of 410g, this is a comfortable set of headphones that doesn’t become fatiguing to wear and doesn’t heat the wearer’s ears anything like as much as some snug designs. Whether or not you want to be seen in public wearing them is, of course, a different matter, but nobody in the market for some decent indoor headphones should discount these Finals if comfort is a big issue. Both earcups are wired, using a nice tangle-resistant cable with satisfyingly chunky chrome twist ’n’ lock connections. The cups themselves are of textured camera lens-grade plastic, with the pads being a prosaic mixture of sponge (rather than the more fashionable memory-foam) and synthetic leather. Between cup and pad sits the driver, elegantly and cleverly integrated into the front plate itself. This configuration – a glass-strengthened polycarbonate resin housing a titanium diaphragm driver – reduces weight, increases stiffness and helps in Final Audio’s quest for optimal balance between pressure in front of and behind the driver. The earcups are connected by a stainless steel/padded synthetic leather headband with plenty of adjustability. And once satisfactorily adjusted, the Final Sonorous IIIs prove a talented, widescreen listen. No matter how generous or confined the soundstage of the music you’re listening to – as sweepingly expansive as Gershwin’s Rhapsody in Blue (CSR Symphony Orchestra under Richard Hayman), or as tight-knit and intimate as Nick Cave & The Bad Seeds’ (Are You) The One That I’ve Been Waiting For? – the Sonorous IIIs find and describe every last inch of it. Instruments are located and locked into position with complete authority and, unlike some competing designs, the space around them is given equal billing. In terms of focus and separation, the Sonorous IIIs are among the best pound-for-pound headphones currently available. Those who value midrange fidelity and detail, and the consequent effect on a singer’s power to communicate, are almost as well served as fans of an explicit soundstage. The Sonorous IIIs convey a vocalist’s state of heart and mind with impressive and gratifying immediacy – slip on a copy of Massive Attack’s Mezzanine, which features two of popular music’s more idiosyncratic and expressive vocalists in Horace Andy and Elizabeth Fraser, and their personalities and passions are laid bare. Where the Sonorous IIIs case starts to look a little less watertight is in the way they manage rhythms and tempos. Revisit Angel from Mezzanine and, putting Horace Andy’s extraordinarily intimate and affecting vocal reproduction to one side for a moment, the headphones don’t quite have the iron grip that’s required. Handled properly, Angel is an implacable tune, as rhythmically foreboding as gunfire. Dealt with by the IIIs, it’s slightly leaden and lacking in momentum. Elsewhere, these Final headphones give a decent account of themselves. They handle sudden or significant dynamic shifts without alarms, have reasonable shine at the top of the frequency range without spilling into harshness, and dig gratifyingly deep at the bottom end. Low-frequency stuff is nicely textured and reasonably agile, too – but that slight lack of rhythmic organisation is more apparent with bass-heavy music. While we’re not sold on the whole idea of calling a model range ‘sonorous’, there’s no doubt these headphones are far from a snooze-inducing proposition. In fact, if you prioritise spaciousness and midrange fidelity above all else, they’re an engrossing listen.